Gooseberry Patch has added another cookbook to their 101 cookbook series. 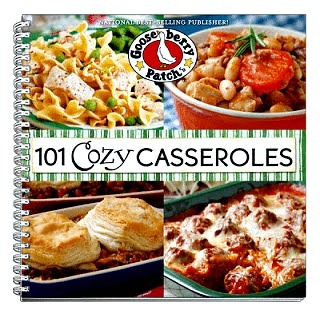 The latest addition is "101 Cozy Casseroles". I'm not sure if you're familiar with the 101 cookbook series, so here's a little background. Each cookbook is a spiral bound photo cookbook with a durable soft cover. Each cookbook has at least 100 tasty pages. The best part about the 101 Cookbook Series is that each recipe is paired with a beautiful, full-color photo. I think the photos are my favorite part. I love being able to see what each recipe looks like instead of trying to imagine them in my head. 101 Cozy Casseroles is the 4th cookbook I own in the 101 cookbook series. This new cookbook is packed full of tried and true recipes from readers and home cooks just like you me and you. Who doesn't love a hot bubbly casserole right out of the oven? My husband that's who, he isn't big on casseroles, but I love them. I'm not saying he won't eat them I just have to choose wisely when it comes to casserole choices. I have always loved the simplicity of one dish meals. Casseroles are budget friendly, easy to prepare and a comfort to enjoy. Just pop them the in the oven and you have dinner in a flash. Pair with a salad and rolls and you have a perfect well rounded meal. I think my favorite chapter is Moms Favorite Casseroles. Most of the recipes in that particular chapter remind me of home. Kickin King Ranch Casserole, Chicken Broccoli Divan, Beef Burgundy, Eggplant Parmesan, Hobo Dinner Packets, Daddy's Shepherd's Pie and Ham & Cheese Spaghetti just to name a few. The Ham and Cheese Spaghetti reminds of a dish my mom always made with leftover spaghetti, but minus the ham. She would mix the sauce and the noodles together and then top it with American cheese. Add it to a casserole dish and bake. I know it was only leftover spaghetti, but it sure tasted like a new dish. My mom was great with leftovers and never let anything go to waste. If she could make it into a casserole than that's just what she did. Don't you just love that about moms? It was hard deciding on which casserole recipe to make. Mom's Texas Hash popped out at me, so that was the first dish on my list. We had just harvested fresh bell peppers and onions from our garden, so I knew they would be perfect for this recipe. This particular casserole calls for only 6 ingredients and isn't complicated at all. Just saute the veggies add in the tomatoes and spices and pop into a casserole dish and bake. The end result was quite tasty and reminded me of Stuffed Bell Peppers. I served this easy Texas Hash over a bed of white rice. This recipe is defiantly a keeper. Next on the list was Taco Filled Pasta Shells. I knew this one would be good because I have actually made this one before. Pasta shells stuffed with a mixture of taco meat and cheese. Three cheese to be exact, cream cheese, cheddar and Monterey jack. Lawrdy you know it's good with all that cheese. When stuffed shells come to mind I tend to think of the Italian version. Well, these are the same concept, but Mexican inspired instead. This recipe uses salsa and taco sauce instead of the traditional marinara sauce. To add a bit more variety I think the addition of black beans or Mexicorn would be a nice touch. Well as usual Gooseberry Patch has hit a home run with another great 101 recipe cookbook. If you're a casserole lover than this cookbook is for you. Right now you can purchase it through Amazon for $13.95. That's right my friends this yummy cookbook hit the shelves on June 16th, so it's available right now! Hop on over to Amazon because they're also offering free super saver shipping on orders over $25, so go ahead and buy two. This cookbook would make the perfect gift. Now for a little Goosey Fun! See below for the complete details on how you can win a free copy for yourself. CONGRATS TO: COMMENT 114 DEB C.
Just leave a comment on this post telling me what you're favorite casserole is? (Mandatory entry) For me it's Chicken Divan or my Friendship Casserole. 1. Become a Fan of Gooseberry Patch on Face book. When you have done that, return to this post and leave a separate comment letting me know that you're a fan. Last day to enter this giveaway will be Midnight on Friday June 29th (CST). I will pick a random winner using random.org and announce the winner on this blog, face book and twitter. Gooseberry Patch provided me with a copy of "101 Cozy Casseroles" for the purpose of this review. They also provided an additional copy to use in a reader giveaway. With that being said the opinions & comments stated above are entirely my own. I would like to thank Gooseberry Patch for choosing Mommy's Kitchen as a "Early Bird Reviewer"
I am signed up with Gooseberry Patch's circle of friends. i love the Heavenly Hash and Eggplant Parmesan! My family loves shrimp and wild rice casserole! I liked Gooseberry Patch on FB. Favorite casserole is chicken and rice casserole. cream of Chicken and hash brown casserole. My favorite is Don Meridith casserole. I am a fan of Mommy's Kitchen on Facebook and my favorite casserole is Penne Pasta Bake. Easy and yummy! I follow Gooseberry Patch on FB..LOVE their stuff!! Just tried a casserole from Pinterest, "country chicken casserole". Hands down, best chicken/noodle casserole I've ever made. My family loves chicken Dorito casserole! I love spicy enchilada casseroles! I love a good mexican casserole. MMM! Who doesn't love taco seasoning and cheesy goodness? A chicken noodle cassarole which is like chicken spagetti. Yum! We love Chicken Ala King Casserole - yum! Signed up with Gooseberry Patch circle of friends. I am a fan of Gooseberry Patch on FB. My favorite is Chicken Rice Divan. My fav cassarole is anything with potatoes and cheese! mmmmm mmmm! Fan of gooseberry on Facebook! fan of mommy's kitchen on facebook! I love Poppy seed Chicken Casserole. Fan of Gooseberry Patch on Face book. fan of Mommy's Kitchen on Face book. I love a shepherds pie! Tator Tot Hotdish for me! My favorite casserole will have to be poppy seed chicken casserole. It must be giveaway day - stop by and enter to win some peanut butter! My families favorite casserole is shepherds pie. I switch the topping from cheese to fried onions for a different flavor. I also make it with multiple veggies, not just one. Chicken cassorole is my favorite! I love French Toast casseroles, nothing like getting up in the morning and popping breakfast in the oven to have it cook while we are all waking up for the day. I am a fan of all but I don't tweet. Kindof stinks to have all these options when all can't be applied. would love to win regardless. I like Green Bean Casserole, especially around the holidays. My favorite is my mother's goulash. My teenager likes to make hasbrown casarole..which is exactly why I need this cookbook because I volunteered to work with our keepers of the home girls next fall!!! My favorite is pizza casserole made with penne pasta. Hi!! I love casseroles! So easy and always yummy! One of my family's favorites is stuffed green pepper casserole. Brown rice, spaghetti sauce, chopped green peppers, and cheddar cheese! So simple and hearty! Thank you so much for sharing this opportunity! I heart Gooseberry Patch!! I love tater tot casserole. My favorite casserole is lasagna! I "liked" Gooseberry Patch on facebook. My favorite casserole is a creamy chicken noodle one. It's nice because it's not just yummy, but very versatile. Love it! I like a galosh casserole my mother-in-law use to make. It is great to take almost anywhere. I'd love to have a copy of this book. I became a fan of Mommy's Kitchen on FB. I joined GP's Circle of Friends. My favorite is a creamy chicken one! Tuna Casserole has been a favorite of mine since forever. I'm a Gooseberry Patch FB fan. I'm in the Gooseberry Patch "Circle of Friends"
Green bean casserole :) my fav standby! I love the friendship casserole dish! I'm a fan of Gooseberry Patch on Facebook! I recently made Gooseberry Patch's Cheeseburger and Fries casserole and my family loved it! I'm a fan of Mommy's Kitchen on Facebook. I'm a fan of Mommy's Kitchen on Facebook! My favorite is the tater tot casserole but instead of tater tots I use fried onions on top. I love gooseberry patch cookbooks. My husband makes 2 recipes, only 2. One is a very good mac and cheese, and the other, my favorite, is "green chile rice casserole" made w/brown rice, green chiles (of course) and pepper jack cheese. Looks like glop on the plate, but so, so good! Our favorite casserole is called Italian Goulash. My all-time favorite casserole has to be chicken and rice - although I've rarely met a casserole I didn't like! I'm signed up for Gooseberry Patch Circle of Friends. I've been a fan of Mommy's Kitchen on Facebook a good while now. Already a fan of Gooseberry Patch on Facebook! My favorite casserole is cheesy hashbrown casserole with ham (or smoked sausage)! And I have been a longtime fan of MK on Facebook! I really like the Texas Hash. It's different from the usual stuff. Whole family loved it. My favorite casserole is Tator Tot Casserole!! Also a fan of Mommy's Kitchen on facebook...because I'm cool like that. I'm with you! Chicken Divan! I am a Gooseberry Patch Fan on Facebook! My favorite casserole is King Ranch Casserole! I am a member of Gooseberry Patch Circle of Friends! I shared the Gooseberry Patch 101 Cozy Casseroles Giveaway by Mommy's Kitchen on my Facebook page! My favorite is Shepards Pie. My favorite casserole is taco casserole or anything with a Mexican theme! I love Green Chile Chicken Casserole...yum! I am a MK facebook fan. I am a Gooseberry Patch facebook fan. My favorite casserole is cheesy potato casserole yummy! Your Friendship Casserole is one of our family favorites around here! I think the Taco-Filled Pasta Shells looks really good. Thanks for the chance to enter. I am a Circle of Friends member. Thanks for the chance to enter. My favorite casserole is Chicken Spaghetti Casserole. I am a fan of Mommy Kitchen and Gooseberry Patch on facebook. My "go to" casserole dish is tatertot casserole - always a hit at our house! I am already a fan of Gooseberry Patch on Facebook. I am already signed up with Gooseberry Patch's circle of friends. I am already a fan of Mommy's Kitchen on FB. My favorite is chicken and rice with peas! Our favorite casserole is Pizza Casserole. Thanks for the opportunity to win this cookbook. I am a friend of Gooseberry Patch on Facebook. Copy cat cracker barrel hashbrown casserole is a favorite in our house! We eat casseroles 3x a week....I need new ideas! I love so many casseroles, buta favorite would probably be chicken spaghetti. I am a Gooseberry Patch fan. I have joined Circle of Friends! I like GP on fb...ciao4now64 at yahoo dot com. I belong to GP circle of friends...ciao4now64 at yahoo dot com. I am a fan of Mommy's kitchen on fb....ciao4now64 at yahoo dot com. I am a friend of Mommy's kitchen on FB. rdewey17 at yahoo dot com. I am part of Gooseberry Patch's circle of friends. rdewey17 at yahoo dot com. I am a fan of Gooseberry Patch on FB. rdewey17 at yahoo dot com. My favorite would be my mother-in-law's chicken and broccoli casserole especially when she puts toasted bread crumbs on top. I am a fan of Mommy's Kitchen on FB! I am a member of the gooseberry patch circle of friends! a big casserole favorite in my house is Tater Tot casserole....it's super easy to make and I am constantly getting requests for it! My favorite casserole is probably lasagna but I do have a chicken divan frozen in case I am too lazy to make dinner some night, I love freezing meals. Generally, my kids are leery of casseroles. But right now we all love chicken and dumplings casserole (recipe from plainchicken.com)! My family LOVES hash brown casserole! They like it with a dash of Texas Pete!